On Red Star Yeast's site, I found this description under their challah: "This egg-rich braid is traditionally served in Jewish households to begin the Sabbath. Try serving for breakfast with fruit preserves or slice thick and use to make superb French toast." With the holidays approaching, the timing of posting this feather like textured challah could not have been more perfect.On Rosh HaShana, a round challah is traditionally baked symbolizing the cycle of the year. I hardly ever bake this loaf pan shape so I decided to give it a go. Surprisingly enough, this challah's taste and fluffy cotton candy texture was identical to the ones I grew up on. If you wish to make a round challah, please see my Honey Challah for instructions. I adapted Red Star Yeast's recipe just slightly. I needed more flour, used 1 1/2 teaspoon salt instead of 2, braided it and baked it at a temperature I am accustomed to at 350F for 35 minutes. The original recipe calls for 400F for 20-25 minutes. This post is part of my professional collaboration with Red Star Yeast. Combine yeast, 1 cup flour, and other dry ingredients. Combine water and oil; heat to 120º to 130º F.
Combine dry ingredients and liquid ingredients in mixing bowl with paddle or beaters for 4 minutes on medium speed. Add eggs; beat 1 minute. Gradually add remaining flour and knead with dough hook(s) 5 to 7 minutes until smooth and elastic. Place dough in lightly oiled bowl and turn to grease top. Cover; let rise until dough tests ripe. Turn dough onto lightly floured surface; punch down to remove air bubbles. Roll or pat into a 12 x 6-inch rectangle. Cut into two 3 x 12-inch strips. Twist the strips together. Place in a 9 x 5-inch greased bread pan or on a greased cookie sheet. Cover; let rise until indentation remains after touching. For a shiny crust, brush with a combination of 1 slightly beaten egg and 1 tablespoon water. Sprinkle with sesame seeds, if desired. Bake in preheated 350º F oven 35 minutes. Remove from pan; cool. A speciality I adore. Your Challah looks really tempting. A beautiful loaf. TY Rosa. I know, right?! Shulie, I'm inspired to try this, I love Challah but rarely bake it. With this loaf version, I don't have any excuses not to (the braiding used to be the issue I think...)! GAH! I want, I want! I want to put butter and honey all over this. I want to make it into French Toast. I want! This looks amazing and so perfect. I'd butter it up and toast it and dip a little in my espresso ;) Yum!!! I remember my first bite of challah...I think I was a newlywed and I fell in love with it immediately! Yours looks picture perfect...and I'm craving a big slice with cold butter....mmmmmmm. aww really sweet memories & you can come over anytime Lizzy. More often than not I got a challah baking in the oven! 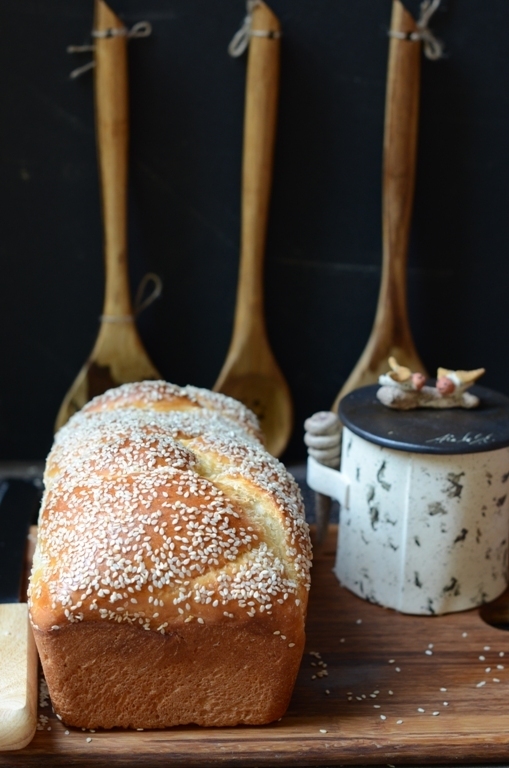 Gorgeous bread, I love the sesame seed topping! TY Laura. My favorite though I should change around and use poppy seeds which I also like. A beautiful loaf, it looks so tender and fluffy. Red Star is my "go-to" yeast, and I agree, I love their recipe section. Haven't made a Challah in years, but every time I have it's been a resounding hit. Love the lightness of this recipe! You haven't? Now you you and you would love it! :) Thx for dropping by! I know, right? !Mine too! Yes, we are in MA. I hope you do the same. Happy weekend! I LOVE challah and yours looks just so perfect. I really want to give it a try soon. TY An. You totally should. Let me know how it turns out? This is so GORGEOUS Shulie .... ♥♥♥! Wow...the loaf looks so light and fluffy! Perfect for a veggie sandwich. Gorgeous loaf! Challah makes for a remarkable grilled cheese or as Sanjeeta mentioned, a light veggie sandwich. Brava, Shulie! Grilled cheese, haven't thought of that Viviane. Thx for the fabulous suggestion! Beautiful Shulie. I can almost smell it. Challah is one of my favorite breads (next to Portuguese Sweet Bread). I love making bread pudding with it during the holidays. This is a gorgeous loaf!! Beautiful! The first thing I thought of when I saw this was Challah French Toast.. or overnight french toast.. either way, your bread is perfectly risen and airy! I am so excited for Fall to baking up wonderful recipes like this! 'airy' how well put & yes my favorite French toast. I still don't make it as well as my mom's and a neighbor makes a killer overnight one. Challah is my favorite bread of all time! Love this recipe!